The 60th season of Britain’s premier touring car series, the most high profile championship in the country. This means I own an anniversary polo shirt which is now 10 years old! Until the other week I hadn’t been to a BTCC round since Silverstone in 2008 (where did the time go?) which ended a 6-year run of visiting at least one round per year, at various circuits including Thruxton, Donington Park and even Knockhill. 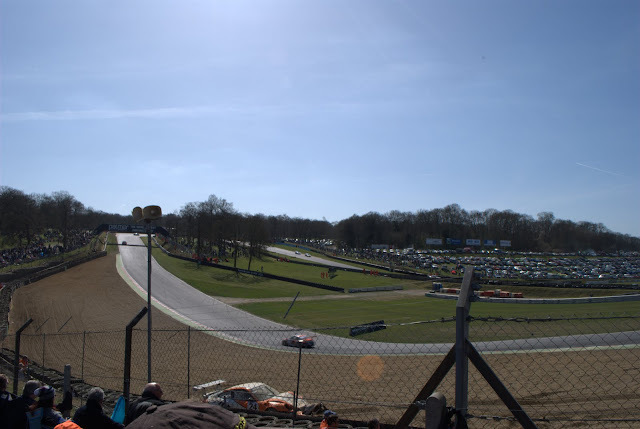 I hadn’t been to Brands Hatch since 2005’s A1GP meeting. It was time to revisit both. In this post I’ll focus on my thoughts, for photos from the day please see my previous post or my gallery on Picasa. Isn’t it great to be trackside? Especially so when not long out of winter, having been stuck indoors for most of it, and you’ve got your nose up against the fence on a warm, cloudless spring day as cars race by at 140mph or more. Just perfect. Perhaps it felt all the more sweeter after a 3-hour drive to the track. I was glad to find the entrance fed me directly to the spectator bank overlooking the pits so I didn’t need to spend time finding somewhere to watch, where I arrived as the BTCC was on the grid for race 1 of 3. 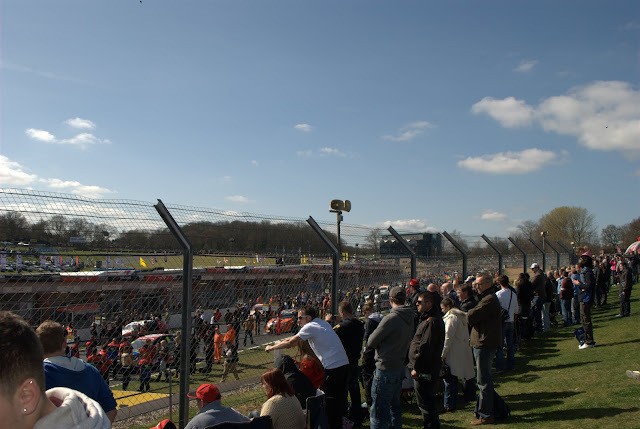 However once the race began I quickly found I didn’t like it there as the fences (and the people) obscured the racing going on up at Paddock Hill or back at Clearways. Cars flashing past is great but I came here to see racing. 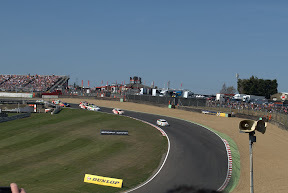 It was great to get so close to the grid and it would be an ideal place to watch a race with pitstops as you can see right into pitlane – but touring car racing doesn’t have any stops so it was time to move! I watched the rest of the race from Clearways. In 2005 I was lucky enough to be in the big hospitality building here which offered a great view. I was surprised to find it was almost as good at ground level, with the added bonus that this time I was watching a race on the Indy loop. There was some great side-by-side action here as you’d expect. Even doughnuts from Rob Collard… for which he was later penalised. An American sanctioning body would celebrate it.. a UK/European body awards a penalty. Idiots! After lunch I went around to Paddock Hill Bend. I was surprised at how little room there is to watch – there’s an earth bank which suddenly drops away to a path. People were perched on the edge of it, I went up there and couldn’t see well over the people. Scratch that idea. I found the absolute ideal spot was just where the tree line begins on the uphill approaching Druids. 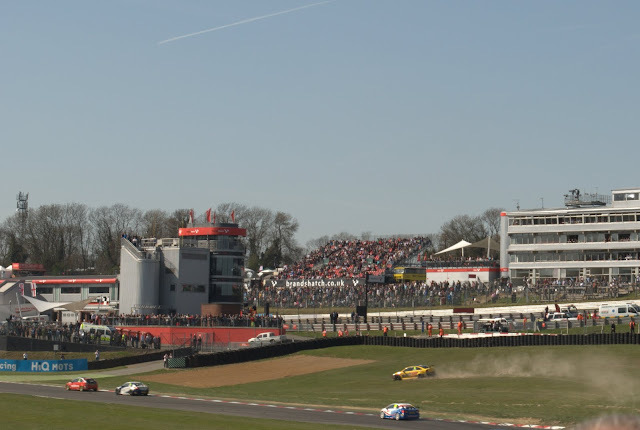 An unobstructed view of Paddock Hill Bend (as unobstructed as can be with this many people around), very fast cars very close to you just as they get off the gas and on to the brakes, and a nice view across to Graham Bill Bend to boot. Trees nearby to shelter under if the sun gets too hot or if it rains. Perfect. I watched BTCC Race 2 and a few supports from here, and after a walk in the support paddock I came back for BTCC Race 3. This is one of my new favourite places in racing. I would consider the nearby grandstand if only to get above the heads of other people, but I don’t think I really missed anything. The only thing I lacked was a view to the left of me, or ‘downstream’ on the track, so I couldn’t see Druids corner or the 7-car shunt caused by oil on the track. Of course, you can never see everything unless you’re at an oval, and I did see Jackson run through the gravel right in front of me as he laid that oil. The one thing I didn’t do all day was get a pass for the BTCC paddock. 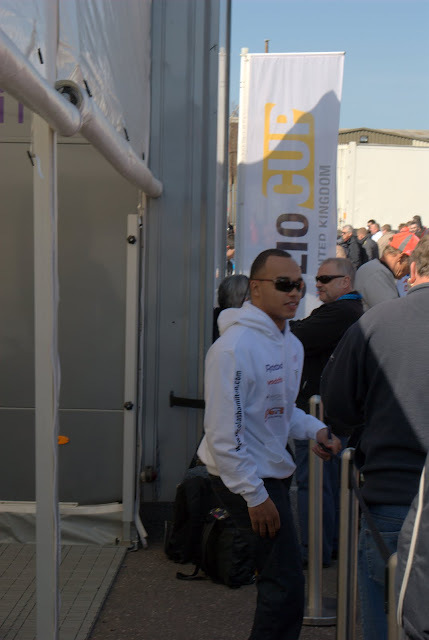 The support paddock was freely accessible and I saw Nicolas Hamilton signing autographs there. I did slightly miss getting up close to the BTCC cars and drIvers too, however I was too busy enjoying myself trackside! The lunch break fell after BTCC race 1. It was then I, as expected, found racetrack food prices to be as high as ever. £8 for the burger and chips I wanted. I settled for a sausage roll for £3. I will say the food selection at most UK racetracks is immeasurably better than it was 10 years ago, commendably so because it often used to be dire, but now they all stick the word ‘premium’ or ‘quality’ on the van and jack up the price. They were selling hot Cornish pasties for a fiver. I can get a hot one 500 yards from my house for less than that and they pay all the costs of renting a shop not a trailer! The price for being a captive audience and not wanting a squashed sandwich from a hot rucksack. The BTCC has long had a poor reputation as a championship which not only rewards the use of the ‘chrome horn’ but encourages it. Everyone loves a bit of doorhandle to doorhandle racing, that’s a part of this type of racing and long may it continue, I’m not advocating removing it, that’s why we love touring cars. The trouble is, in this series it goes to another level. It was why I stopped attending races after 2008 and stopped watching the series altogether two years ago. What isn’t acceptable is the continued practice of getting a nose inside and just pushing the guy on the outside, into the gravel. The worst offenders are the biggest name drivers Jason Plato and Matt Neal, who are probably popular because they act a bit ‘bad boy’ on the track, pushing their way around. Most of the rest of the grid doesn’t go in for this type of thing, which is great to see. I really did miss watching the series so I have actually started watching the races I missed from 2010 and 2011, and I’ve been laughing at some of the post-race quotes. Someone like Onslow-Cole or Shedden would come on, standing next to someone like Matt Neal, and say right in front of him: ‘Well I could’ve easily had him off, but that’s not the way I like to race.’ Even though the guy next to him had already done it to someone else that day. Ha! I make this point because I’d really hoped the series would’ve clamped down on it by now. They haven’t. Newcomer and polesitter Dave Newsham, underdog hero of the day, was unceremoniously dumped off track into the Paddock Hill gravel by Plato. Penalty? A £750 fine and 3 points on his racing licence. Hardly any penalty at all. I haven’t seen the most recent rounds at Donington Park this past weekend, I understand it stepped up another level with cars off left, right and centre. Perhaps the more frustrating thing is that both Plato and Neal come across as really nice guys (even when they are complaining about the technical rules! ), it isn’t as if they are utter evil bastards, they are merely taking advantage of the series not clamping down on certain actions – they do it because they get away with it. Still, it provokes discussion and ratings and the crowd at any BTCC meeting at every track I visit has always cheered the loudest when Plato wins, so he must be doing something right. One of the hallmarks and attractions of the TOCA/BTCC package has long been the plentiful support card. This is again true this year. It was a touch weaker compared to past times, with the closure of FBMW UK a few years ago and the sad failure of FRenault UK this past winter, which is by far the bigger loss for British motorsport being the traditional feeder into British Formula 3. A disgraceful loss and I don’t understand how it was allowed to happen, I really do hope something is done to resurrect it for 2013. FRUK offered the chance for up and coming drivers to make a name for themselves in front of a big crowd on live TV, I doubt the many other FR 2.0 series in Europe offer the same. Despite being two races down the day was still full of action, there was barely 10 or 15 minutes of dead track all day (excluding the lunch break and red flags). A collection of Renault Clio Cup, Porsche Carrera Cup and both big and Junior variants of Ginettas kept the crowd entertained all day long. Hard to believe they let 14 and 15 year olds loose in the Juniors! Despite the poor driving standards I still love the BTCC. Everything about the day was perfect and I’m sad I was away for so long. The feeling was just as it was a decade ago. There’s an intangible atmosphere at a BTCC meeting you just don’t get when you visit other series. I don’t know if it is the wheel-to-wheel racing, the near-constant track action from a collection of short, sharp races, or the fact it is our big home-grown success story with passionate fans filling the banks and stands all the way around the track. There’s something about a BTCC meeting you just can’t beat. And I didn’t even buy a paddock pass this time! I’ll be back. See you at Silverstone? (I’m wondering if I made the right choice in booking Silverstone). I’m tempted to go to Thruxton.. but we’ll see about that. 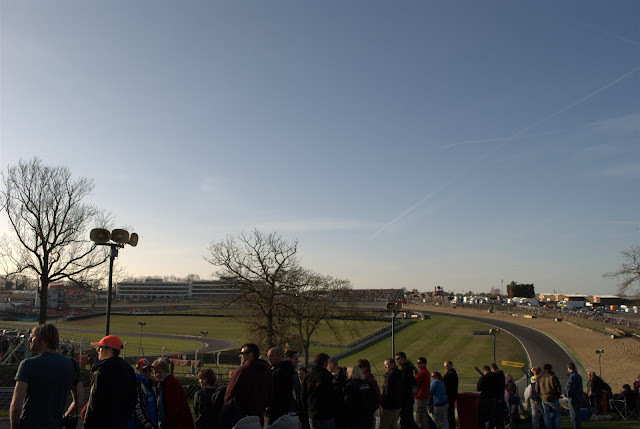 Just maybe, funds depending, I’ll go back to Brands Hatch for the race on the GP circuit later in the year. 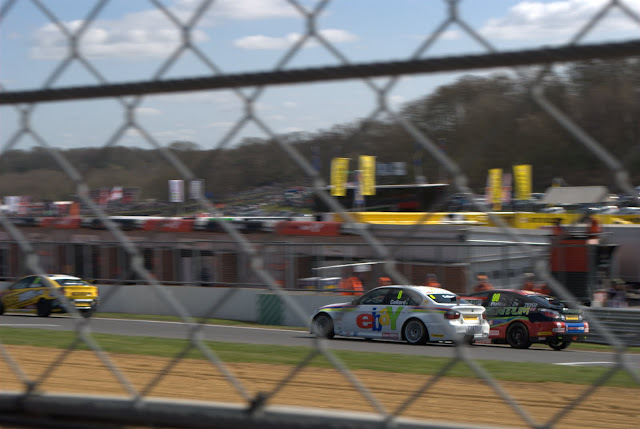 Here are a selection of photos of my day at Brands Hatch last Sunday for the opening round of the BTCC season. I brought along my new Nikon to try out at a racetrack for the first time, some of the shots are mildly good, most aren’t because I’m not a photographer or because I had fences and people in the way. Still, I had fun, it was a glorious sunny day (unlike today) and a perfect first racing event of the year. Nicolas Hamilton, brother of Lewis, has a disability but it doesn't stop him racing in the Renault Clio Cup. 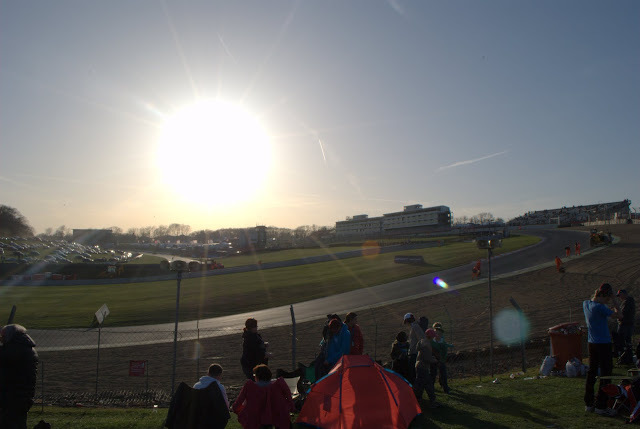 You can see a lot at Brands Hatch if you find the right location. End of the day. Time to pack up and go home. 'Til next time. You can see more of my photos in my Picasa album. How did I spend my Easter Sunday? Watching racing – hey you know me, what did you expect? I had no plans all day and this was the first fully-stacked motorsport weekend of 2010, there’s no way I was going to miss it. I woke at 7.45am when my alarm beeped, a cleverly-timed alarm designed to get me downstairs for 8am for the BBC F1 pre-race show. I hit the off button and promptly fell asleep until 9am. 9am.. The race starts at 9am! Cue a mad rash downstairs. I arrived as the cars rounded the last corner on their warm up lap. That was close. I watched the race in a bit of a daze, trying to fire up the live timing which was having troubles of its own, as well as trying to find the 5Live commentary feed and other accoutrements to enjoying F1. You can read my thoughts on the F1 race elsewhere, the important point is that as soon as it was over it was time to flick over to ITV4 to catch some BTCC action from their first meeting of the year at Thruxton – but wait, what’s this, Superleague Formula’s first race at Silverstone was on at the same time? Which to choose? The answer of course, is both. I had Superleague’s official free web stream on my PC, with the BTCC coverage on my TV. I found I was more into the Superleague so I muted the TV. To be honest I wasn’t really following either race all too well, if you combine following two races with keeping up with Twitter and other sites which were reporting on the BBC F1 Forum happening at the time which I’d abandoned, there was a lot of information to take in. Eventually there was time for a break for shower, breakfast and a cup of tea at something like 1pm. Perfect for a Sunday normally, the hunger hurt a little after being up since 9.. 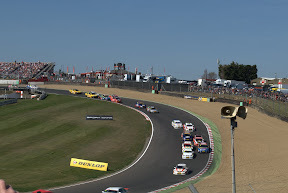 The BTCC support races were playing out during this time and I watched a couple of them, the Porsches were as tedious as ever despite their larger grid – and the Clio Cup was as madcap as ever despite their much reduced grid! At 2pm came another decision. SF race 2, or BTCC race 2? I took the same solution as before since the internet had become awfully quiet, I’m guessing people were off doing family things for Easter. I muted the TV again and again barely followed the touring car race, I’ve found no reason to get interested in it this year. Conversely, I’ve never watched Superleague Formula before and I’ve been openly critical of the entire concept. I still don’t like the concept and their timing and scoring system is very confusing with the three letters representing teams not drivers, but I tell you what, they’ve made the right choices on the car and engine package and on the driver choices. There was top notch racing in race 2. Bourdais fought his way up, Montagny passed several cars from the back to finish 8th or so, and this Dolby fellow is quite a find isn’t he? I thought it was a very good race, lots of passing yet it was nice and clean. Not like BTCC race 3 which was the last race of the day at Thruxton, after a couple more support races. I watched this with the sound off as well because I was listening to ‘Giggles Radio’ on Sidepodcast, but since listening to music is a little less taxing than watching a race I was able to follow this encounter a little more. 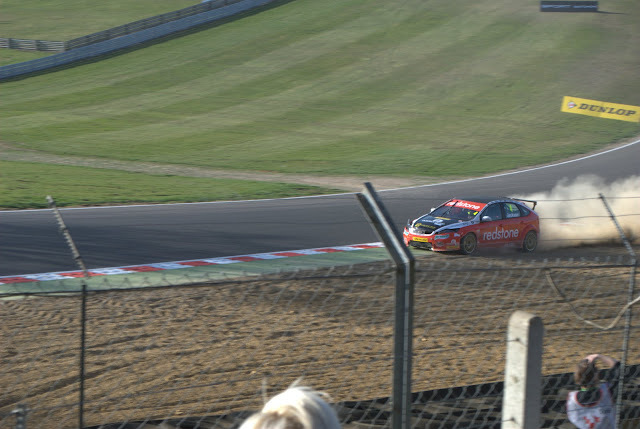 It seemed okay other than what looked to me to be very slow-looking touring cars, until Matt Neal decided to get up to his tricks and just rammed Rob Collard into the barrier. He claimed he had nowhere to go, which is nonsense. 3 cars, 1 ahead and 2 side by side with Neal one of the two. He just rams the car in front such that it loses momentum and the 3rd car knocks it into a spin because he genuinely can’t avoid it. Had Matt backed off and remained side by side behind the first car, they’d all make it round and he’d have a good drag race on the front straight. Crazy behaviour. I used to be a Matt Neal fan until a couple of years ago when he seemed to ramp up his antics. He’s just a knobhead, and so are the BTCC stewards for not clamping down on him. I used to dislike Plato for similar things but he seems to have got better recently. Literally minutes after this race ended, the WRC Rally Jordan review was beginning on the Dave channel (for non-UK people, yes we have a TV channel called “Dave”). I half-watched this but the antics with the penalties to get a favourable road position left a bad taste. After this I went out for some clear air and a walk and came back to write my Malaysia review. On the whole a rather exceptionally lazy day of watching racing and while there were some negatives it was a thoroughly enjoyable day. One of the more interesting sub-plots was seeing the work being done at Silverstone. I’d seen pictures but nothing in video, and it was very strange seeing the current front straight with a gravel trap where the grandstands used to be, and some new stands erected outside of it. Being up close was part of that area of Silverstone but I guess what you lose in proximity you gain in being able to see more of the straight. The place looked a bit raggedy in places as there is still work ongoing, but generally much more modern than before, and I expect to see it looking somewhat nicer come the F1 and MotoGP events in the summer. A good day overall then. What did you do? Just one week after the Indy 500 the teams and drivers head to the traditional follow-up event at the Milwaukee Mile – this will be the 52nd time Milwaukee directly follows Indy in the schedule and the 3rd time under IRL sanction, it really is one of those long-time Indy-racing traditions. According to IndyCar.com the last driver to win both events back-to-back was Juan Pablo Montoya in 2000. I like Milwaukee, it can be a lot of fun and it is a different kettle of fish to the 1.5 milers the IRL usually uses. To Italy! I still haven’t caught up with MotoGP so I really have no idea what’s going on, but this track ought to sort them out. The German tourers head to the road course layout at the EuroSpeedway. Turn one is always fun but to be honest this isn’t my favourite DTM race of the year because the huge stands make the place look empty and the track itself isn’t very interesting. There is always a bit of fun at turn one at the start, otherwise there isn’t much to be said. The good news is that we in the UK return to live coverage for this event, so if you have Setanta be sure to check it out. UK – LIVE on Setanta Sports 1 at 12.30pm. Worldwide – LIVE on www.dtm.tv from 2pm CET / 1pm BST / 8am EDT. When you follow that link it will ask you to choose one of two sites, pick the right-hand one. The live link is on the top right of the page. I’ve never liked this circuit. It can produce the odd reasonable race but I just don’t like it! In many ways it shares several characteristics with Lausitz. Lots of tight turns, a long straight, lots of seats that aren’t filled..
LIVE on Eurosport at 11.45am (race 1) and 1.45pm (race 2). The return of the F2 name to the contemporary motorsport scene, except this time rather than being an open formula it is a spec series run to a budget. It is pitched as a Formula 1 feeder but in all honesty it’ll find itself competing with FR3.5 to get people into GP2 with the odd guy getting a test & reserve deal in F1 – not to mention this is yet another fracture of the development ladder! Still, if it give opportunities to talented drivers who can’t afford the alternatives then it will have served its purpose well, and perhaps it is other series that need to be cut back. Time will decide that one. Eurosport at 5pm Saturday (delayed race 1) and 12.45pm Sunday (LIVE race 2). Note race 2 slots directly between the two WTCC races in the Eurosport schedule! There is also live coverage on the series website at 2.20pm CET Saturday and 1.50pm CET Sunday. Oulton Park is an excellent and deceptively tricky circuit which is a lot of fun to watch!